Within your ClassJuggler administration, a special pop-up screen allows you to manage the policies & agreements you need your customers to acknowledge during enrollment. The Policies & Agreements screen also lets you to easily add additional policies that you have on-file for a customer that were not acquired during an enrollment. The Policies/Agreements tied to each customer represent their acknowledgement of, usually, a hard copy form that the customer reads and signs and is kept on-file by your business. Simply select a policy to add to the customer and enter the date that the customer signed the agreement that you have on-file. 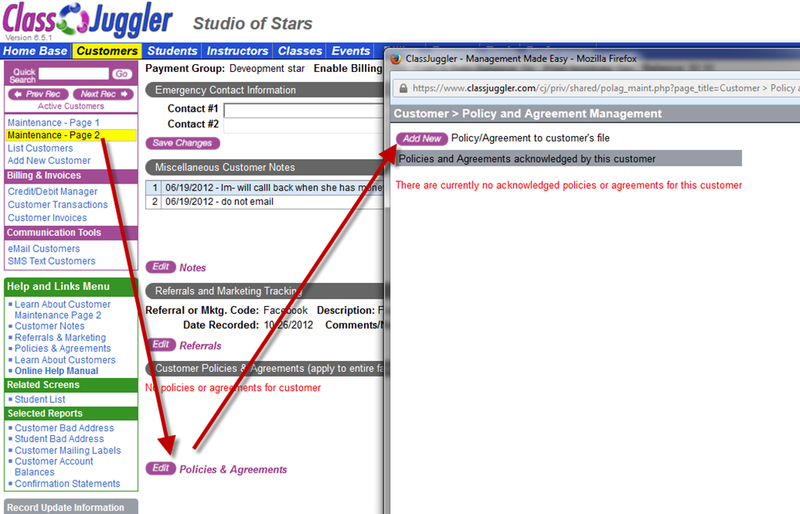 Each policy/agreement has a title, policy text, as well as the date and the person who added the policy to the customer. Each policy/agreement also has a Delete action button to allow you to delete old policies and agreements that may have been replaced by newer policies. Contact us if you have more questions about how to use this feature. This entry was posted in Cheer ClassJuggler, ClassJuggler Dance, ClassJuggler Dojo, ClassJuggler Fitness, ClassJuggler for Franchises, ClassJuggler K-12, Music ClassJuggler, Product Info, Swim ClassJuggler and tagged customer management on June 24, 2015 by classjuggler. Question: How do I apply “one-off” customer transactions that won’t fit the automatic payment management procedures that I normally use? 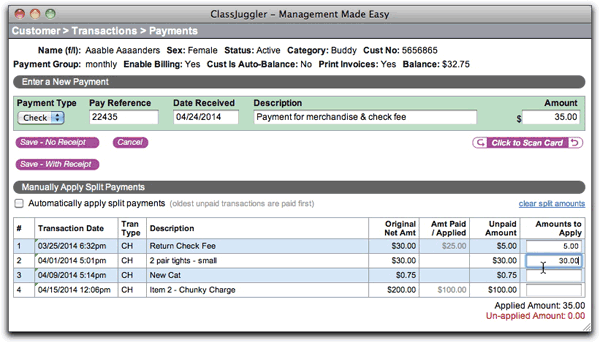 Answer: Use ClassJuggler’s “Manually Apply Payments and Credits” feature! ClassJuggler’s built-in accounting system automatically applies payments and credits to open charges by default, making it drop-dead easy to manage and track which students have or haven’t yet paid for their enrolled class. But sometimes a unique payment or account crediting situation arises. With the Apply Payments & Credits Manually setting enabled on the preferences screen (Preferences > ClassJuggler Features when you’re logged in), your administrator can choose how to apply payments and credits to open charges. This is especially useful if your business has flexible payment plans or very specific needs for how payments and credits are recorded. You can choose to manually apply payments or credits when your enter new payments and credits or when clicking on an existing payment or credit that has not yet been fully applied to open transactions. Applying payments and credits to open transactions are essentially the same process – ClassJuggler lists an open charge with its “unpaid” amount, allowing an administrator to assign part or all of a payment or credit in order to apply payment to and “close” the open transactions. Need to identify payments and credits across all of your customers that have not been fully applied? No problem – just use the Reports > Financial Reports > Unapplied Payment and Credits report to help. Simply enter the payment or credit information as you would normally. Once the amount has been entered into the amount field, ClassJuggler will be able to help calculate the split payments or credits you wish to enter. Automatically apply the payment or credit – If you want ClassJuggler to automatically split the payment across the open charges, simply click on the “Automatically apply split payments” checkbox. This will apply the payment to the oldest open transactions first and continue until the total amount has been used or there are no more open transactions. Manually apply the payment or credit – If you want to choose how to split the payment or credit amongst the open transactions, follow the instructions below. Tab to a field and type an exact amount you wish to apply to certain open transactions. If you decide you want to start over and clear out all of the applied amount split entries, simply click on the clear split amounts action link just above the “Amounts to Apply” column. As you click-enter or type your applied amount splits, the applied amount and remaining unapplied amount will be recalculated after each entry just at the bottom of the “Amounts to Apply” column at the bottom of the list of open charges. NOTE: – When entering a new payment or credit, you do not have to apply all or any of the amount if you do not want to. For example, you could enter a $100 payment and apply only $10 of it to an open transaction leaving the other $90 for later use – even if additional open transactions exist. Alternatively, after logging in, go directly to the Manually Applied Payments and Credits help screen here. As always, customers can contact us directly for assistance. This entry was posted in Cheer ClassJuggler, ClassJuggler Dance, ClassJuggler Dojo, ClassJuggler Fitness, ClassJuggler K-12, Music ClassJuggler, Product Info, Swim ClassJuggler and tagged customer management on June 22, 2015 by classjuggler. Are you a musician? Do Maya Angelou’s words resonate with you? Then share with your music school students! Voice and music schools rely on ClassJuggler’s web-based business software to manage class scheduling, customer billing, online bill pay, and all other “backend” office matters. Learn more about how Music ClassJuggler’s Voice school, band camp, and music school business software can help you orchestrate your business! 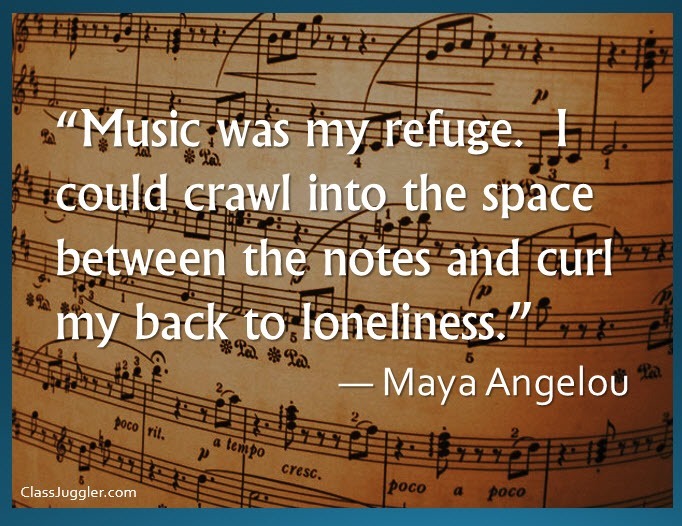 This entry was posted in Motivation, Music ClassJuggler and tagged Maya Angelou, music on June 14, 2015 by classjuggler. 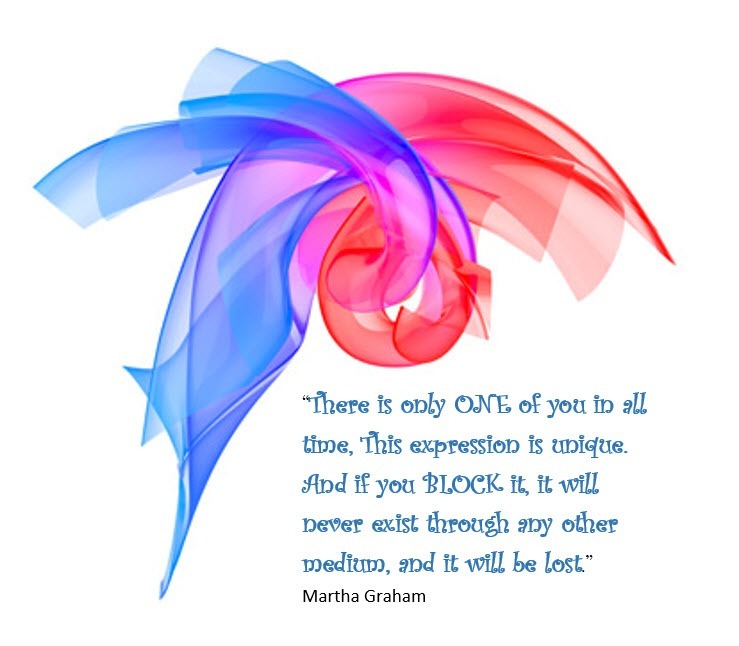 Martha Graham Wisdom: Express Yourself! “There is only one of you in all time. This expression is unique. And if you block it, it will never exist through any other medium and it will be lost.” ― Martha Graham. Don’t block it. Be it in your business and in the expression of your talents. If you agree with these words of encouragement, then share this with your students! 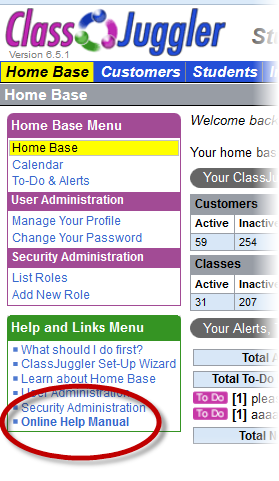 To learn more about how ClassJuggler can help you manage your school, schedule, and students, check us out. This entry was posted in ClassJuggler Dance, Motivation and tagged express yourself, Martha Graham on June 5, 2015 by classjuggler. Martial Arts–You Never Fail til You Stop Trying! 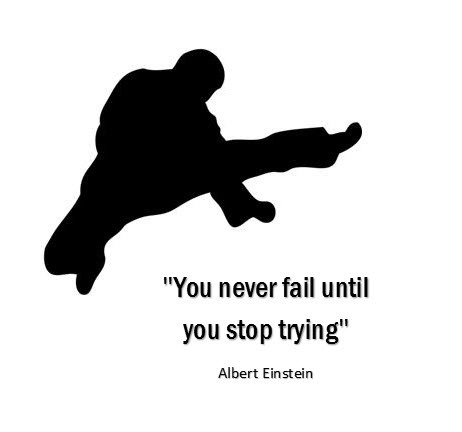 Maybe Einstein wasn’t a martial arts practitioner, but it’s a truth worth sharing, don’t you think? Many martial arts schools turn to ClassJuggler’s web-based business software to manage dojo class scheduling, customer billing, online bill pay, and all other “backend” office matters, so that they can focus their time on helping their students to never stop trying! Learn more about how ClassJuggler’ Dojo’s martial arts business software can help you managing your school! This entry was posted in ClassJuggler Dojo, Motivation and tagged Albert Einstein, dojo mmanagement, martial arts schools on June 2, 2015 by classjuggler.